Accelerating widespread clean energy innovation is an indispensable part of an effective, long-term global response to our shared climate challenge; necessary to provide affordable and reliable energy for everyone and to promote economic growth; and critical for energy security. While important progress has been made in cost reduction and deployment of clean energy technologies, the pace of innovation and the scale of transformation and dissemination remains significantly short of what is needed. For these reasons, participating countries have come together to launch Mission Innovation to reinvigorate and accelerate public and private global clean energy innovation with the objective to make clean energy widely affordable. To promote clean energy innovation in Mexico, the Mexican Government established the Energy R&D Funds in 2008. These Funds are designed to be the engines that promote a level of research and technology development that allows Mexico to address the great challenges of its energy sector, including an increased demand for energy resources, pollution and climate change. These Energy R&D Funds are jointly led by the Ministry of Energy (SENER) and the National Science and Technology Council. The Energy R&D Funds receive annual contributions from the Federal Income Budget Law, which stipulates that 0.65% of oil revenues shall be divided among the Energy R&D Funds and the Mexican Institute of Petroleum. As a member of Mission Innovation, Mexico pledged to double its investment in research and development of clean energy technologies. Mexico hereby reaffirms its commitment adopted in Paris on November 30th, 2015 and in this document, details its plans to more than double its R&D investment in clean energy technologies over the next five years. The objective of the Energy R&D Funds, the Hydrocarbons Fund (FH) and the Energy Sustainability Fund (FSE) is to fund and support scientific research, technology development, innovation, human capital development, promotion and technology deployment in energy. 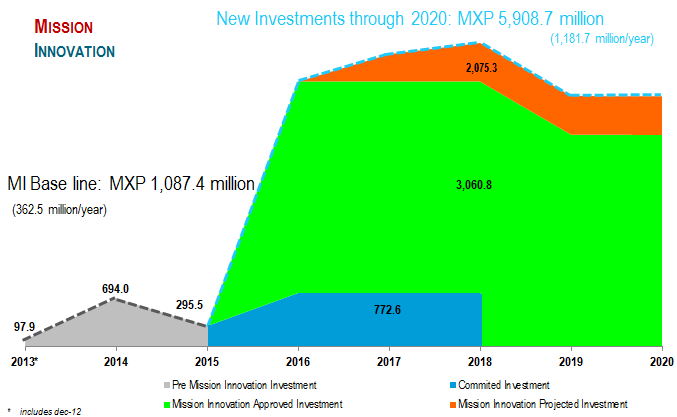 Both Funds focus on expanding Mexico’s energy matrix. The FSE focuses on clean energy and sustainability, while the FH focuses on improving, optimizing and expanding the hydrocarbons sector to meet the country’s growing energy needs in a responsible and sustainable way. The FSE allocates its resources through calls for proposals. This Fund has published 27 calls for proposals since its creation in 2008. As a result, the FSE has approved 131 projects, with many more projects currently in the evaluation process. Efforts in this area focus on three Mexican Energy Innovation Centers that work on research and technology development for its respective renewable energy. There are also several independent projects, many of which are researching on solar PV panel materials. The geothermal effort also focuses on the support given to de Mexican Geothermal Energy Innovation Center, although a new collaborative project between Mexico and the European Union, which will develop on Enhanced and Super Hot Geothermal Systems, will begin in December 2016. The Energy Sustainability Fund is currently supporting three small CCUS projects. In addition, SENER has an initiative for research and technology development as well as a CCUS pilot plant, that will be built with the support of the World Bank ($25 million dolars); the call for proposals for this project will launch in 2017. The Energy Sustainability Fund has begun the operations of five research clusters on biogas, bioalcohol, solid biofuels, bio jetfuel and biodiesel. In addition, there are several projects on biological waste to fuel using agave and other endogenic plants. SENER is funding several projects designed to build institutional capacities, including laboratories enhancements, graduate program, technical training and research groups creation. These kinds of projects focus on renewable energies, clean technologies, energy matrix diversification, energy efficiency, and sustainability. Large projects in smart grids and energy efficiency will begin in 2017, including a Mexican Energy Innovation Center for research and technology development in Smartgrids. These kinds of projects will be essential to maximize the potential of distributed energy generation, a new area of opportunity that has opened up as a result of Mexico’s Energy Reform. Over the last several years, the FSE has been actively engaging and working with international partners as part of its strategy to promote stronger interaction and collaboration with leading international institutions. This year, the FSE launched Mexico’s first Energy Frontier Research Center, involving 5 Mexican research institutions, led by Mexico’s National Autonomous University (UNAM), that are collaborating with a number of research institutions in the United States. This EFRC is focused on synthesis and characterization of clean energy materials. Other examples include a 20 million Euro project on Enhanced (EGS) and Super-hot (SHGS) Geothermal Systems in a collaboration with the European Commission. 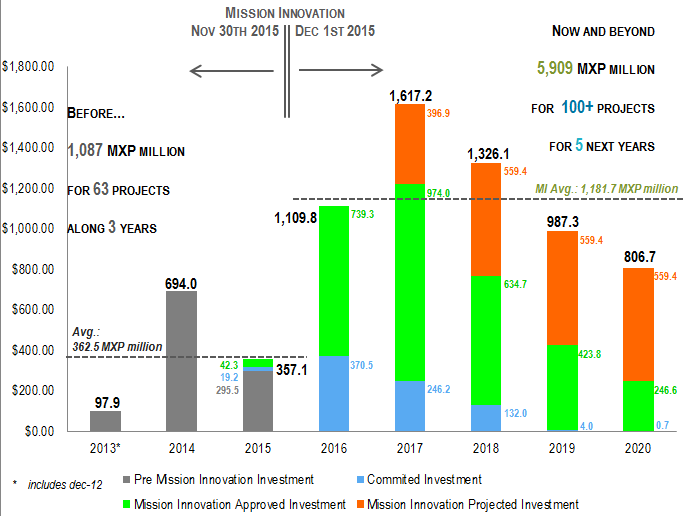 Mexico’s baseline with respect to the Mission Innovation commitment is defined by the investments made through the Energy Sustainability Fund (FSE) over the three-year period prior to Mexico’s integration to Mission Innovation, from the 1st of December 2012 to the 30th of November 2015. The establishment of Mexican Energy Innovation Centres (CEMIES) represent the largest projects that are currently being developed on clean energy R&D in Mexico. The CEMIES are expected to provide a platform to launch and grow an unprecedented portfolio of low carbon activities, through a guaranteed 4 years funding scheme to deliver low carbon innovation.